Diatoms are abundant photosynthetic organisms in aquatic environments; they contribute 20 percent of global primary productivity. Their fucoxanthin (Fx) chlorophyll (Chl) a/c-binding proteins (FCPs) have exceptional light harvesting and photoprotection capabilities. However, the structure of the FCP proteins and arrangement of pigments within them remain unknown. 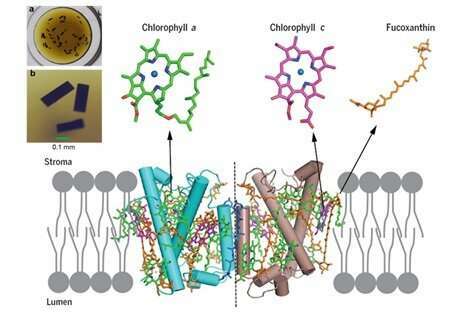 A research team from the Key Laboratory of Photobiology, Institute of Botany, Chinese Academy of Sciences, has solved the crystal structure of an FCP protein from a marine pennate diatom Phaeodactylum tricornutum. The study, titled "Structural basis for blue-green light harvesting and energy dissipation in diatoms," was published in Science on February 8, 2019. The FCP membrane-protein was purified as a homodimer from P. tricornutum and crystallized. The structure was solved by X-ray diffraction at a resolution of 1.8 Å , which showed that each FCP monomer contains seven Chls a, two Chls c, seven Fxs, one diadinoxanthin (Ddx), two calcium cations and several lipid molecules. Compared with light harvesting antennas from higher plants and green algae, the number of Chls is much less, whereas that of Fxs is much larger in the FCP, resulting in a much higher Fx/Chl ratio. These features, together with the unique arrangement of pigments uncovered, indicates fast energy coupling of Chl c not only with Chl a but also with Fx. Furthermore, each Fx is surrounded by one or more Chls, providing a basis for efficient energy transfer between them and also efficient dissipation of excess energy under high light conditions. The binding environment of the two end groups of each Fx showed different hydrophilicities within the protein scaffold, suggesting differences in their preferred absorption region of the blue-green light. One Ddx molecule was assigned to a position close to the monomer-monomer interface with a weak electron density, suggesting its easy dissociation from the apoprotein and possible involvement in the Ddx-deepoxidation cycle that functions in excess energy dissipation. "The network of specific pigments demonstrated by the first and high-resolution FCP structure reveals a solid basis for blue-green light harvesting and super photochemical quenching in diatoms," said Professor Shen Jianren, a corresponding author of this study. "This research provides a new model for theoretical simulations of photosynthetic energy trapping and transfer, and may also aid in designing photosynthetic organisms with enhanced light-harvesting and photoprotection capabilities," said Shen.